New Hampshire, A Poem; with Notes and Grace Notes entered the public domain January 1, 2019, for which Frost won the Pulitzer Prize in 1924. 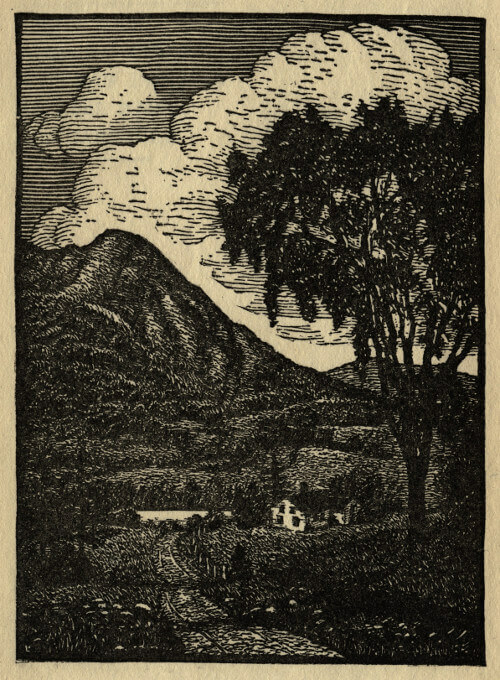 The first edition features woodcuts by J.J. Lankes. We feature it in Poetry for Students. Much matters. You may work for all of me. I’ve seen the time I’ve had to work myself. Is the disgrace in man or state or nation. Off his. The time was evening in the Pullman. “I see the porter’s made your bed,” I told him. And vindicate the state’s humanity. (In verse I think) against the Volstead Act. Until I asked for one to steady him. This is called having an idea to sell. From selling things in California. The hope of being, as we say, received. A drover with me on the road to Brighton. Rose like a factor’s at a trading station. And he was rich, and I was still a rascal. Where had he been and what had he been doing? In dealing in “old rags” in San Francisco. Oh it was terrible as well could be. We both of us turned over in our graves. Which naturally she doesn’t care to sell. He’s your one chance to score against the state). The Daniel Webster ever was or shall be. She had the Dartmouth needed to produce him. And before that of exploration even. In being there so early in our history. They’d been there then a hundred years or more. Today an honored one in Nottingham. Mankind had not yet gone on the Sabbatical. Not to explore too deep in others’ business. And boys the minute they get out of college. I can’t help thinking those are tests to go by. Sussex because they’re spoken of by Herrick. But not gold in commercial quantities. And marriage rings of those who owned the farm. What gold more innocent could one have asked for? Of radium or anything to sell. A specimen of everything, I said. She has one witch—old style. She lives in Colebrook. Was lately at a cut-glass dinner in Boston. There were four candles and four people present. Her gift for reading letters locked in boxes. Were metal than it was when they were wooden? It made the world seem so mysterious. Was cognizant. Her husband was worth millions. And give someone the Skipper Ireson’s Ride. One each of everything as in a show-case. Something else to protect her from herself. There quality makes up for quantity. Not even New Hampshire farms are much for sale. I had to take by force rather than buy. “I like this better.” It was really better. And so not good for anything but cider. Far up the birches out of reach of man. Poems produced than any other thing? So much more business-like than business men. Their wares are so much harder to get rid of. She’s one of the two best states in the Union. One thick where one is thin and vice versa. But soon divides the river with Vermont. Is only corners, cross-roads in a wood). Laughed the loud laugh, the big laugh at the little. And like the actress exclaim, “Oh my God” at? Whole townships named but without population. Excepting that they differ in their mountains. New Hampshire mountains curl up in a coil. I had been coming to New Hampshire mountains. And here I am and what am I to say? Here first my theme becomes embarrassing. “I go no more to summer in New Hampshire. The little men (it’s Massachusetts speaking). Of several books against the world in general. Or even nation’s to restrict my meaning. To dry, from poor to rich, or back again. From nearly everything that goes on round me. I shall not lack for pain to keep me awake. No less than England, France and Italy. Is no proof that I aimed them at New Hampshire. The nearest boundary to escape across. Than those I left behind. I thought they weren’t. I thought they couldn’t be. And yet they were. Harris of Derry, and Lynch of Bethlehem. To want to make New Hampshire people over. They taunt the lofty land with little men. I don’t know what to say about the people. As long as life goes so unterribly? In literature to date is heard to come. Out of not having cause for misery. On nothing worse than too much luck and comfort. Under the new régime, and so forbidden. And shot. It’s Pollyanna now or death. And sad on a foundation of wellbeing. “You hear those hound-dogs sing on Moosilauke? Retired from politics and joined the chorus. “Go ’long,” I said to him, he to his horse. And how was that for other-worldliness? I’d elevate the already lofty mountains. Is that her mountains aren’t quite high enough. I was not always so; I’ve come to be so. To heave them higher to the morning star? Can it be foreign travel in the Alps? Of Lincoln, Lafayette and Liberty? The fountain in proportion to the basin? Which shows how sad an accident may be. Five thousand is no longer high enough. Down from the stars to freeze the dew as starry. The way the wiry gang-boss liked the log-jam. She’s still New Hampshire, a most restful state. I had to make an almost funny choice. I wouldn’t be a prude afraid of nature. There’s been enough shed without shedding mine. That showed itself in dendrophobia. And educated into boards, he said. And never over-stepped it save in dreams. By worship under green trees in the open. A black-cheeked stone and stick of rain-washed charcoal. Comes too near to Ahaz’ sin for safety. Nothing not built with hands of course is sacred. Rather of what to face or run away from. I’d hate to be a runaway from nature. Louder than actions, and sometimes achieves it. It seems a narrow choice the age insists on. How about being a good Greek, for instance? That course, they tell me, isn’t offered this year. (From say a publisher in New York City). And restful just to think about New Hampshire. At present I am living in Vermont. 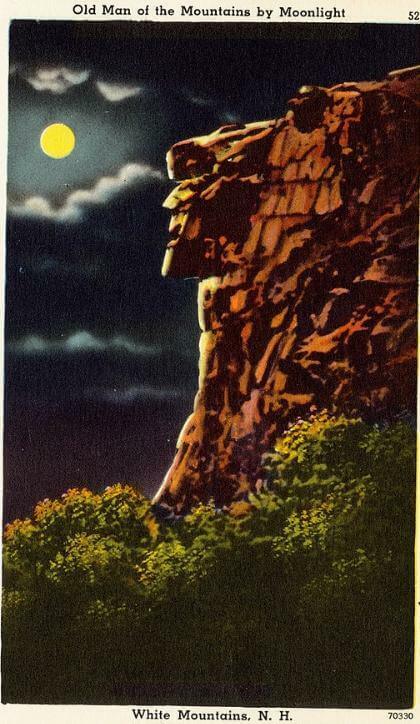 You may enjoy reading Nathaniel Hawthorne's The Great Stone Face and works by other Pulitzer Prize winners. Add New Hampshire to your own personal library.